When hair dyes first came out, the main ingredient used in coal-tar dyes caused allergic reactions in some people. Most hair dyes now are made from petroleum sources. But the FDA still considers them to be coal-tar dyes. This is because they have some of the same compounds found in these older dyes. There have been some studies that have linked hair dyes with a higher risk of some cancers. Other studies, though, have not found these links. But keep in mind most hair dyes don't have to go through the same safety testing that other cosmetic color additives do before they're sold in stores. Cosmetic makers have stopped using compounds known to cause cancer in animals. But chemicals made almost the same way have replaced some of those cancer-causing agents. Some experts feel that these newer ingredients aren't much different from the things they're replacing. 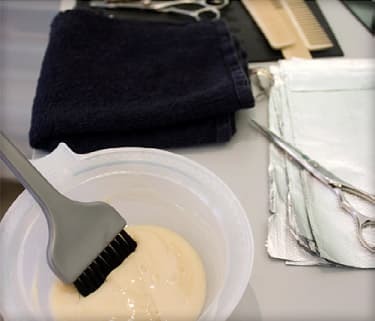 Health experts suggest that you may reduce your risk of cancer by using less hair dye over time or by not dyeing your hair until it starts to gray. Don't leave the dye on your head any longer than needed. Rinse your scalp thoroughly with water after using a hair dye. Wear gloves when applying hair color. Carefully follow the directions in the hair dye package. Never mix different hair dye products. Be sure to do a patch test for allergic reactions before applying the dye to your hair. Almost all hair dye products include instructions for doing a patch test. It's important to do this test each time you dye your hair. Make sure your hairdresser also does the patch test before dyeing your hair. To test, put a dab of dye behind your ear and don't wash it off for two days. If you don't have any signs of allergic reaction, such as itching, burning, or redness at the test spot, you can be somewhat sure that you won't have a reaction to the dye when it's applied to your hair. If you do react to the patch test, do the same test with different brands or colors until you find one to which you're not allergic. Never dye your eyebrows or eyelashes. The FDA bans the use of hair dyes for eyelash and eyebrow tinting or dyeing even in beauty salons. An allergic reaction to dye could cause swelling or increase risk of infection around or in your eyes. This can harm your eyes and even cause blindness. Spilling dye into the eye by accident could also cause permanent damage. "Caution: Contains lead acetate. For external use only. Keep this product out of children's reach. Do not use on cut or abraded scalp. If skin irritation develops, discontinue use. Do not use to color mustaches, eyelashes, eyebrows, or hair on parts of the body other than the scalp. Do not get in eyes. Follow instructions carefully and wash hands thoroughly after use." Not much is known about the safety of hair dyes during pregnancy. It's likely that when you apply hair dye, only a small amount is absorbed into your system. So very little chemicals, if any, would be able to get to your baby. In the few animal and human studies that have been done, no changes were seen in the developing baby. Talk with your doctor if you have questions or concerns. FDA: "Hair Dye and Hair Relaxers." National Cancer Institute: "Hair Dyes and Cancer Risk." How can I deal with split ends? Lead in Toys: Could It Be Lurking in Your Home?